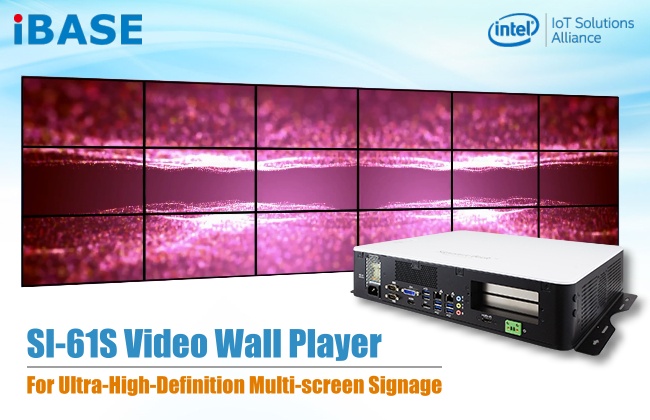 Taipei, Taiwan, April 27, 2018 - IBASE Technology Inc. (TPEx: 8050), a world leading manufacturer of digital signage players and embedded systems, debuts its SI-61S ultra-high resolution and highly expandable video wall player developed specifically for multi-screen video wall signage environments. It is equipped with Intel's latest 7th Generation desktop processor and can be integrated with a Matrox, AMD or Nvidia PCI-E (x16) or two PCI-E (x8) graphics cards to play super high-resolution, eye-catching content in different screen layouts in order to captivate and engage consumers. Taking the most common 3x3 video wall as an example, the SI-61S with a nine display-output Matrox C900 PCI-E (x16) graphics card can play ultra-high-definition images and videos of up to 6K x 3K resolution. For an ultra-large 6x3 video wall requirement, it can be connected with two nine-output PCI-E (x8) Matrox C900 graphics cards for playback of up to 12K x 3K UHD images/videos. In addition, it can be connected to a single large-screen video wall with a single-output PCI-E (x16) graphics card for playback of 8K super-high-definition images/videos. An external 4K video capture card can also be used to provide live video input. The system includes two low-profile Mini PCI-E slots with both full-size and half-size slots. WiFi, Bluetooth, 4G LTE or video capture cards can be installed to increase the convenience of network connectivity. It provides flexible video wall configuration and resolution setting modes, as well as the latest IBASE sole iCONTROL smart energy-saving and remote monitoring technology. Users can take advantage of this exclusive technology for intelligent energy-saving, auto-scheduling, automatic power resume, low-temperature power-on protection and intelligent OS recovery functionalities. The SI-61S features remote system temperature, voltage and fan speed hardware monitoring that contribute to lower maintenance costs, enhanced system stability, and a 24/7 long-term stable operation. The system’s product life cycle is estimated to be more than seven years. IBASE Technology Inc. is a reputable manufacturer and supplier of industrial motherboards, embedded systems, panel PCs, digital signage players and network appliances in the Industrial PC and fast-growing IIoT market. Since it was established in 2000, IBASE has been committed to the production of high quality products, and to the rendering of excellent services. The company is publicly listed in the Taipei Exchange (TPEx: 8050) and is now a leading global provider of innovative industrial and embedded computing products. IBASE has a full range of digital signage system products catering across vertical markets including retail, fast food, hospitality, education and financial. Depending on their requirements, customers can choose the models based on performance, number of displays, resolution and ventilation designs. IBASE digital signage players feature advanced remote management that easily refreshes content and increases uptime while lowering costs. IBASE has partnered with leading digital signage platforms including Scala, Omnivex, Quividi and Navori.